New Zealand drew first blood in their three-Test Gallaher Cup series against France, but they were made to fight for their 23-13 victory at Eden Park in Auckland on Saturday night. The home side outscored the tourists two tries to one, but it took an Aaron Cruden penalty seven minutes from time to seal the win that extended the All Blacks' 19-year unbeaten record at Eden Park to 31 matches. Man of the Match: New Zealand winger Ben Smith was caught the eye as he powered his way to 95m with ball in hand that included a crucial linebreak in the build up to scrum-half Aaron Smith's first half try that saw the momentum swing back the hosts' way. Key Moment: The game was very much in the balance on the hour mark with just one converted score between the sides. France winger Adrien Plante and centre Florian Fritz then carved an opening for No.8 Louis Picamoles who was unable to take the ball cleanly with the line in front of him. Hero of the Game: All Blacks centre Ma'a Nonu was involved throughout with a couple crowd-pleasing linebreaks the highlight but he was equally influential in defence where he was at his inspirational and tackle-hungry best. Villain of the Game: All Blacks fly-half Aaron Cruden didn't have his best game in an All Blacks shirt with several early penalties failing to find their target and a worrying four missed tackles blighting his match stats. Talking Point: It appears the All Blacks' jersey has some magical powers. Centre Ma'a Nonu has struggled to find his best form all season with the Highlanders but the moment he pulls on New Zealand colours he rediscovers the kind of form that made him one of the best players in the game. Highlanders coach Jamie Joseph must be scratching his head. Play of the Game: The pick of the All Blacks' two tries was that scored by Sam Cane but the flanker owed a great deal to two of his team-mates. Centre Ma'a Nonu set up the score by carving his way up the middle before finding scrum-half Aaron Smith on his shoulder who then skilfully flipped the ball to Cane for a simple score. France, however, showed enough to suggest the rest of the series, in Christchurch next Saturday and New Plymouth the week after, will be keenly contested. They had a great chance to level the scores midway through the second half, and put real pressure on the All Blacks, but Louis Picamoles, who was one of the Tricolores' best performers, couldn't hold on to a low pass from centre Florian Fritz just out from the posts. France, in their first match at the ground where they lost the Rugby World Cup 2011 final, struck first in the 10th minute. Utilising the experience of two of their key players, Picamoles created a turnover, and the ball found Thierry Dusautoir in the backline in broken play; the captain fed Fritz, who found space out wide on a curving run then linked with his midfield partner, Wesley Fofana, to take an inside pass and touch down for a converted try. Cruden had a couple of opportunities to get the home side on the board with penalty attempts, but he found the target only with his third attempt. In a contest with plenty of intensity and expansive play, the All Blacks swung the match their way with two tries in five minutes late in the opening half. Winger Ben Smith continued his outstanding form this season with a scything run that supporting half-back Aaron Smith finished off by dotting down. France half-back Maxime Machenaud landed a penalty to level the scores, before Aaron Smith's backing up again paid dividends. This time, second five Ma'a Nonu, who had been struggling for form this season, pierced the defensive line and Aaron Smith carried on to send flanker Sam Cane over. Cruden's conversion made it 17-10 at half-time. Camille Lopez landed a penalty to narrow the scores six minutes into the second half and the visitors then had a chance to score with a succession of pick and goes at the New Zealand line - but the defence held. Cruden landed a 59th-minute penalty to extend the lead to seven points before the French wasted another opportunity. 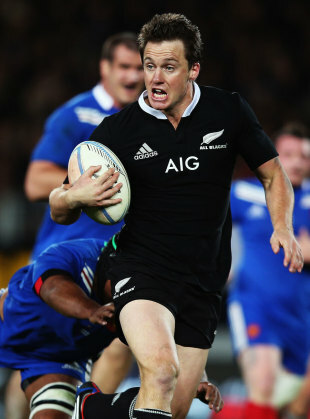 Plante broke the defence and fed to Fritz inside but a certain try was lost when Picamoles dropped the ball three metres out from the unprotected All Blacks' line. Cruden finished the scoring with his third penalty with eight minutes remaining.